With Valentine’s Day around the corner, Disney Junior has released Mickey Mouse Clubhouse: MINNIE-RELLA. Inspired by the iconic fairy tale of Cinderella, this new adventure is a perfect way for the whole family to celebrate Valentine’s Day together. Our Clubhouse pals need to get Minnie a surprise present, so they keep her busy with plenty of chores to do. Tired from so much work, Minnie falls asleep and dreams that she is MINNIE-RELLA! MINNIE-RELLA needs a lot of help to get ready for Prince Mickey’s Grand Ball! With a wave of her wand and some “Mouseke-doodle-lee-doo” magic, Minnie-rella’s Fairy Godmother, Clarabelle, transforms an ordinary tomato into a magnificent carriage and Minnie-rella’s raggedy dress into a beautiful gown that is perfect for a princess. But Minnie-rella’s enchanted dance with Prince Mickey at the ball must end when the spell is broken at midnight. With our help, Prince Mickey finds the princess who fits into her lost glass slipper – Princess Minnie-rella! Before watching, the special my 2-year-old daughter, Ava, and I made Mickey sugar cookies. 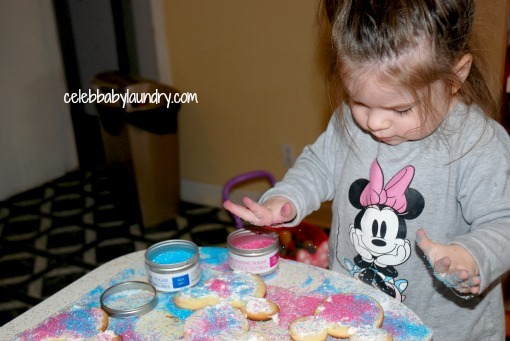 The great thing about sugar cookies is that they’re toddler friendly – easy to make, fun to decorate and not hard to cleanup (more of a plus for mom). Ava loved the Mickey cookie cutter and got a kick out pushing it into the dough. As you can see, she got a little over excited while decorating the cookies with sugar sprinkles! Ava’s favorite stuffed toy to take to bed is her Disney Store Cinderella, so I knew she would love the special MINNIE-RELLA adventure. 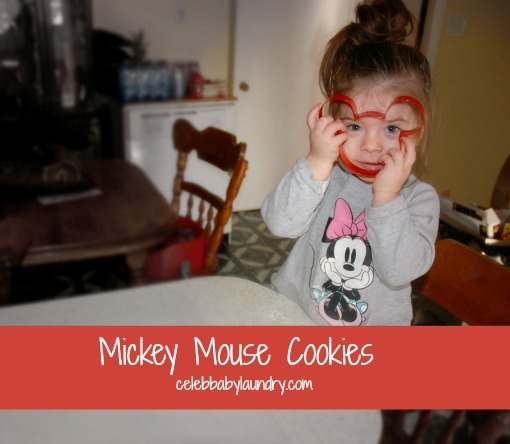 While munching on Mickey cookies, she enjoyed the fun songs as she watched her favorite characters take on various roles from the original story. The Mickey Mouse Clubhouse: MINNIE-RELLA DVD also comes packaged with FREE Castle Play Set, 3 additional Mickey Mouse Clubhouse episodes and 10 Minnie’s Bow-Toons Shorts. To add to the fun download these fun MINNIE-RELLA activities. 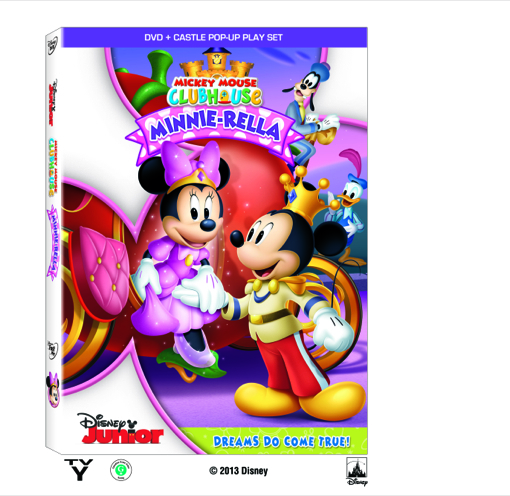 The Mickey Mouse Clubhouse MINNIE-RELLA DVD can be purchased online and in stores. The special also airs on TV on Friday, February 14, 2014 at 9:00 a.m., ET/PT on Disney Channel and 5:30 p.m., ET/PT on Disney Junior. Disclaimer: Celeb Baby Laundry has not received any payment as a result of this review, but received a viewing package in order to facilitate the review. All opinions are our own.